← Short Service Record – No. 8211, Robert Norry Wilson! 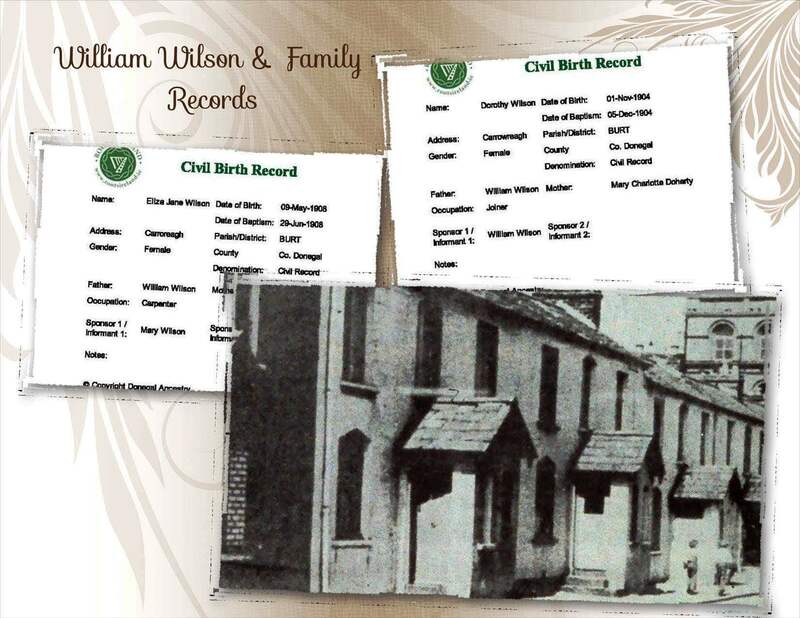 Just recently a “Twist of Fate” led me back in time to Burt, Co. Donegal to discover many more of my Wilson ancestors. Eliza Jane Wilson is my 2nd great grand aunt; sister of my 2nd great grandfather Thomas and daughter of William. Eliza was born in Burt, Co. Donegal circa 1848; unfortunately, I have been unable to find a birth or baptism record for her. 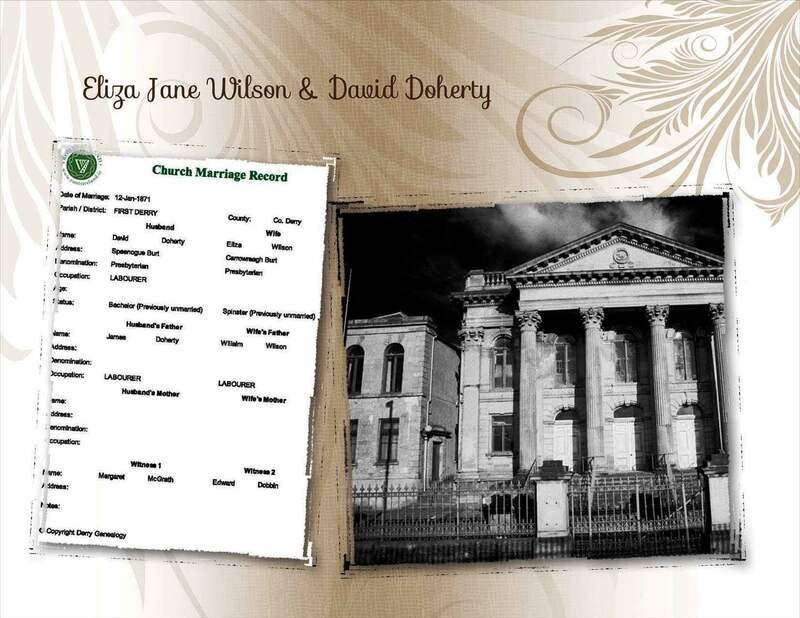 On 12 Jan 1872 Margaret McGrath and Edward Dobbin witnessed the marriage of Eliza to David Doherty in the First Derry Presbyterian Church, Londonderry. The Marriage record revealed that David’s father was James – both he and Eliza’s father were labourers. In 1901 Eliza, David and their daughter Mary, who was twenty one at the time; where living in 28 Carrowreagh, Burt. The census revealed that the family had a three year old boy visiting them – his name… Thomas Wilson Diver! This confirms, without a doubt; that this is my family. Thomas Wilson Diver is my 1st cousin 2x removed, the son of Eliza Wilson and George Diver! That’s a story I’ll delve into another time! On 9 Nov 1903 Eliza was widowed when her husband David died at the young age of fifty seven. Their daughter, Mary was listed as the informant of his death. Just over one year after the death of her father on 20 Dec 1904, in a Civil Ceremony; Mary of Burt, Donegal married William Wilson of Rosemount, Londonderry. Maggie Goligher and Robert Wilson, the brides brother and sister, witnessed their wedding. It would seem I had uncovered another family link… Mary’s new husband William was my great grand uncle, the son of Thomas, and Mary’s first cousin! Another Crooked Branch to follow in what seems to becoming a “shallow gene pool”! 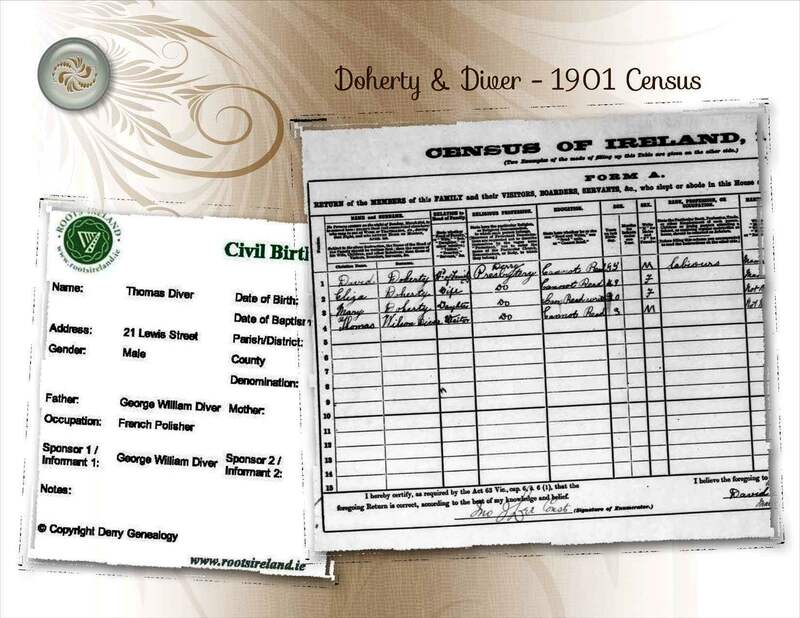 The Doherty family was found living in 21 Carrowreagh at the time the 1911 census was taken. Much had changed for my family in the ten years since the 1901 census had been recorded. Details revealed that not only was Eliza Jane widowed, her daughter Mary was also widowed. On 30 Jul 1909 at 29 Cottage Row, Londonderry William Wilson, a carpenter, died from “Morbus cordis (unspecified heart disease) and Pneumonia Certified”. After five short years of marriage Mary lost her husband and Dorothy and Eliza Jane lost their father. 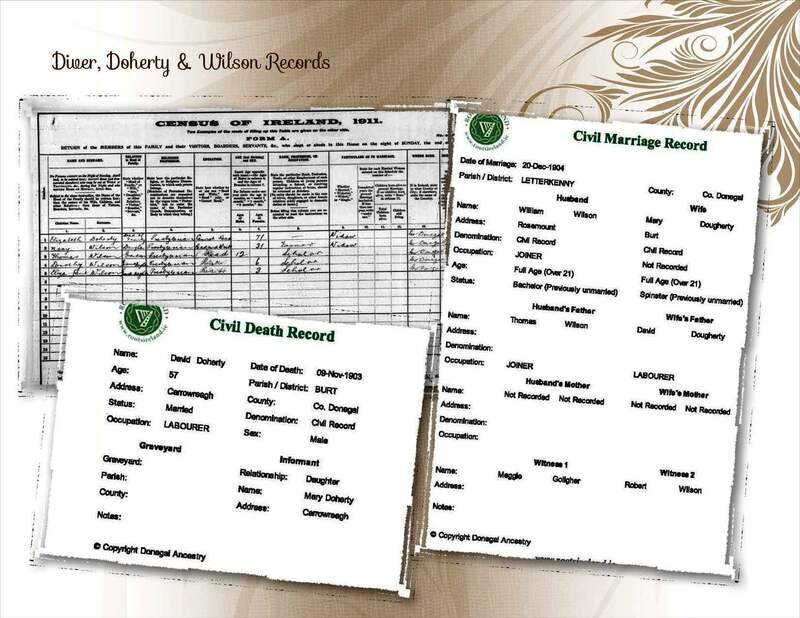 This entry was posted in Co. Donegal, Co. Londonderry, Family History, Geneaology, Ireland and tagged Co. Donegal, Co. Londonderry, Diver Family, Doherty Family, Family History, Genealogy; Ireland; Records, Norry Family, Wilson Family. Bookmark the permalink. 6 Responses to Londonderry to Donegal, Again! Sharon, I sent you a message on Facebook, check out your “other” in box. We are 2nd cousins!